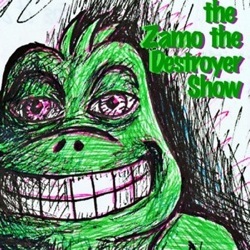 Zamo’s back after a few weeks of no shows due to the bad weather that is surely Technical Support Monkey’s fault, despite Chimpette’s denials and refusals to right the wrong by moving to the Los Angeles area. In other news, Chimpette now has her house but won’t listen to Zamo’s helpful color suggestions. She also has a defective cubbyhole desk that’s devoid of secret money compartments for Iggy to pilfer. Also, Pierre and Georgie pop by for a visit. Pierre has found a job, but sadly has not found his way to be with the other filthy French hippies out in Tofino.